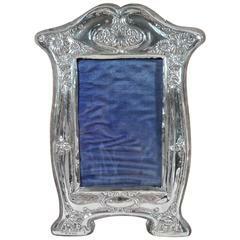 American Art Nouveau sterling silver picture frame, circa 1900. Shaped oval widow set in solid surround with acid-etched leaf ornament: loose and fluid blooms entwined with window border. With glass, silk lining, and velvet back and hinged support. Indistinct maker’s mark – probably Meriden Britannia, a Connecticut maker that was part of International. Dimensions: Frame: H 4 3/8 x W 3 3/8 in. Window: H 3 1/8 x W 2 1/8 in. By Boots Pure Drug Co.
By Simpson, Hall, Miller & Co.